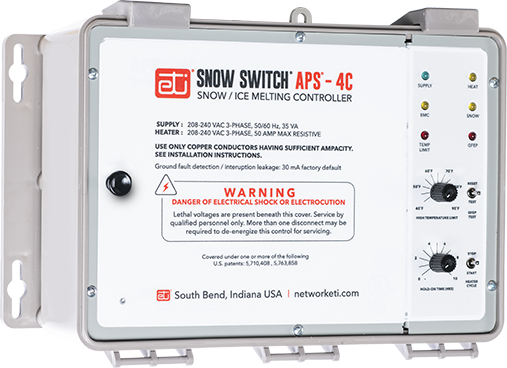 The APS-4C Snow Switch when used with one, or more, compatible sensors automatically controls snow/ice melting heaters for minimum energy costs. Applications include pavement, sidewalk, loading dock, roof, gutter and down spout snow/ice melting in commercial and industrial environments. The APS-4C is interchangeable with the earlier APS-4. The adjustable hold-on timer continues heater operation for up to 10 hours after snow stops to ensure complete melting. The optional RCU–4 Remote Control Unit can be located where system operation can be conveniently observed. It duplicates many of the APS-4C front panel functions. System test Switch toggles the heater contact on and off. If temperature exceeds high limit, heater cycles to prevent damage. From the front office to the production floor, we go above and beyond to help make your project successful.